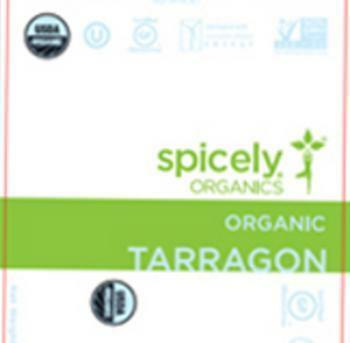 Spicely Organics of Fremont, Calif., is recalling Organic Tarragon that has the potential to be contaminated with Salmonella. There have been no reports of illnesses to date. It was sold through retails stores and e-commerce in Alaska, Arizona, California, Colorado, Hawaii, Illinois, Indiana, Kansas, Maryland, Michigan, Minnesota, Nevada, New Mexico, New York, Ohio, Oregon, Pennsylvania, Texas, Virginia, Washington and Wisconsin. Customers who have purchased the product may return it to the place of purchase for a full refund. Consumers with questions may contact the company at 1-510-440-1044 ext. 1001 Monday – Friday, 7:00am – 2:30pm (PST).